Sweat drips off the tip of your nose. Nice. Keep your head down and plow forward, hard. Pedal after pedal consistently identical and as boring as the last, each breath echoing loudly between your ears. A steady rhythm of beats keeps your heart at pace. As a vehicle passes, dust fills your nostrils with that familiar clay smell, masking the blooming ditch flowers and salty air. Within the first minute of the climb, you had wanted to slow down and hit a low gear, cruise control, but you didn’t and you don’t, because this maximized monotony is expected. Well known, comfortable, rehearsed, and really, it’s exactly what you are searching for. Plow forward. 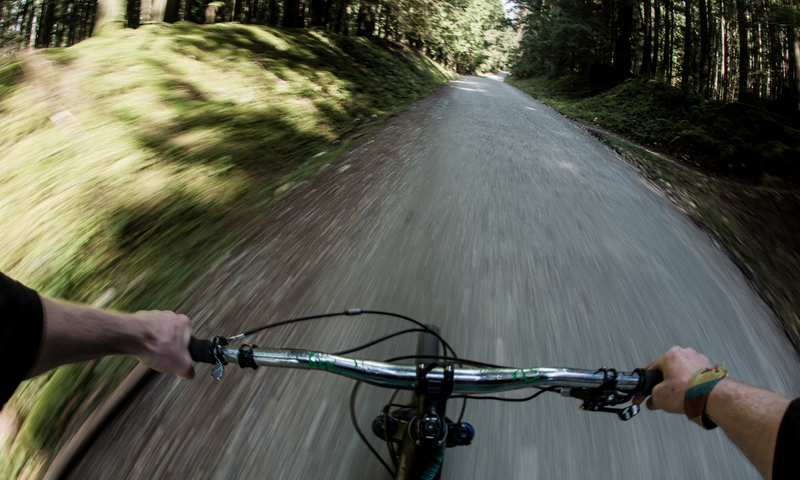 The growing trend of building mountain bike climbing trails is a fantastic thing. There are clear merits for riding up a technical climb, as the mind’s attention focuses intently on the challenges of the trail, and the next root or feature to climb up and over with intensity and perseverance. It brings challenge and enjoyment to – let’s face it – the least enjoyable aspect of the pedal-up to ride-down dynamic. But there are times when you don’t want to think about the trail, the next feature, or really anything at all on your climb. Times when you just want to lose yourself in the cycle of exertion, to let your mind wander and explore freely. This is when the bleak and barren, monochromatic Forest Service Road (FSR) ascent thrives, and pedalling up those dusty slogs often presents a much richer experience than initially expected. With over 100 years of solid logging and forestry history, the Sunshine Coast has a plethora of FSRs providing endless access to flowing descents through vibrant and lively rainforests. Some of us began riding these roads out of necessity, but there is a growing trend to embrace both the fitness and mental aspects of the gravelly FSR grind. Trees crawl by; a bear glances up from the brush to watch you pass. Head down, legs pumping, repetition, sweat . . . eventually there’s that moment where you click into a different level of consciousness, a Zen-like calm as you fall into synch with your surroundings. Cruising forward on the edge of flow and the edge of reality like waking from a dream, the mind drifts into the knowledge of the forest and the storms of the past, the history of the animals and people alike that roamed these areas past and present for millennia. There is a sense of oneness, it doesn’t last forever, but with practice, you can stay here despite that nagging knee or burning lungs. So, why do many fail to engage in this experience? The FSR climb is too often regarded with disdain as a mere side note, an unfortunate artefact of their lack of shuttle vehicle or climbing trail. Such thinking is muddled at best; the beauty of the fire road lies in its simplicity. Pedalling without a steady stream of obstacles or maneuverers lets the mind wander free as muscle memory takes over. In this space and time, you can think openly and dive into your own head, sifting through things that get pushed aside in the chaos of the everyday world. Problem solving through this sort of open brainstorming of random ideas leads to creative solutions and understandings. It is within this space where eureka! moments are facilitated. Diving inwards opens us outwards, which increases our understanding of the world. And then, the original reason for it all, the downhill. Opposing gravity through sweat and sinew creates an incredible amount of potential energy. You know, without fail, that this stored energy will instantly be transferred into kinetic motion the moment those circles connected to your feet and hands start rolling under their own power. Your muscles warm, blood flowing, body balanced, and mind strong, sorted, clear, and absorbing all that the downhill experience offers. Feel the flow. Learn to love the Forest Service Road. Expand the mind and the body will follow.